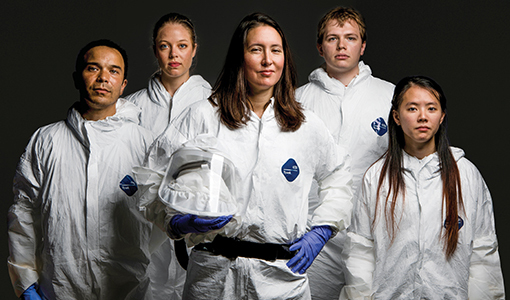 Bree Aldridge and her team are revolutionizing how we understand and treat this deadly disease. 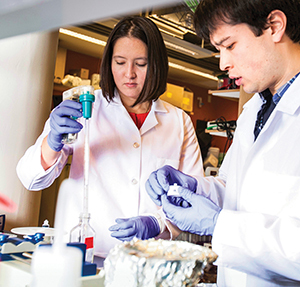 Walking into Bree Aldridge’s eighth-floor lab at Tufts University School of Medicine in Boston is not for the faint of heart. Step one, empty your pockets—phone, wallet, keys. What goes in doesn’t come out—not even the air, and definitely not the lab notebooks, which is why the windows that look onto the hall are littered with Post-it notes of data points. Next comes the first layer of personal protective gear: respirator, gloves, hair cover, safety glasses. Finally, suit up in a pair of white Tyvek coveralls, booties, a second pair of gloves, and sleeve protectors, with tape securing every opening. A red line on the floor marks the point of no return; step over that, and you’re officially ready to start the workday. “It takes a couple months to get used to how it is, and then it’s sort of like riding a bike,” Aldridge said. Now a ten-year veteran of the process, she can do it in five minutes flat. Consumption” got its nickname for the way its victims waste away, as if consumed from the inside by their illness. Jane Austen is believed to have died from consumption as is gunslinger Doc Holliday. But TB is no scourge of the past—it is very much alive today, and growing stronger all the time. It recently had the dubious honor of exceeding both HIV/AIDS and malaria as the leading cause of death in the world from a single infectious agent. In 2016, more than 10 million people fell ill with tuberculosis; 1.7 million of them died from it. That’s the equivalent of the entire population of Portugal getting sick every year, and two-and-a-half times the population of Boston dying. The first time I saw them, I thought they were really weird,” Aldridge said. We were sitting in her office on the Tufts’ Health Sciences campus, watching a video she had captured of TB bacteria dividing in culture. 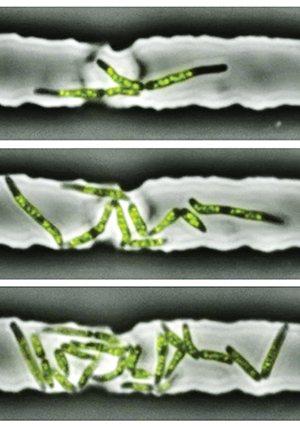 Stills from a time-lapse video showing the asymmetrical growth and division of mycobacteria cells. 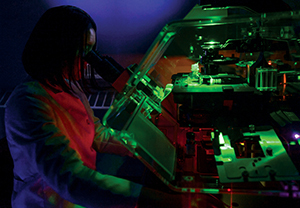 Opposite page: Bree Aldridge working in the lab with former Tufts research technician Owen Bennion in 2013, shortly after she arrived at the university. The Aldridge lab’s work “has the potential to make the difference in how we approach the development of drug regimens,” said Tufts’ John Leong. Tufts alum Dawn Gross on why hard conversations about life and death are so important to have right now. A look at the successes and future of the Maine Track program, a partnership between the School of Medicine and Maine Medical Center. A pediatric cardiologist reaches young patients through literature. Jody Schindelheim helps budding physicians grapple with the emotional burdens of the profession. 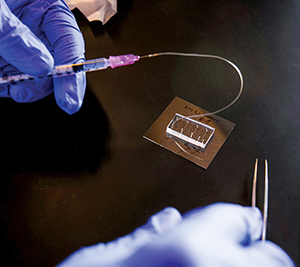 A new wearable device puts Tufts on the frontlines in fighting high blood pressure.